You see in the photo of all the beautiful vegetables given to me by the wonderful lady from New Jersey that there are some very long beans, I have had long beans in Asian cuisine but never actually made them myself. I decided to take this Asian green bean and take them to Italy. This dish is similar to something my Mom made when I was a child. She would cook green beans in tomato sauce,the tomato and green beans were usually from my Fathers garden. It was one of my favorite meals, I loved to grate some pecorino romano cheese on top and eat with bread. I changed it a little adding some linguine to the beans and sauce. Long beans have a distinct flavor similar but not exactly like green beans. If I had to describe it I would say it’s more floral if that makes any sense to you. They are delicious and become very tender when cooked. The beans were cooked with shallot and garlic in tomato sauce from those beautiful fresh tomatoes you see here. You really don’t need a recipe for this, nothing has to be exact, make it according to taste. Approximately 1/2 lb long beans, washed, stem end cut and cut the beans to whatever size you find manageable. Heat some olive oil in a saute pan, add the shallot, garlic and crushed red pepper flakes and saute until they softens, add the beans and toss to combine with the oil and aromatics saute for a couple of minutes. Add the tomato sauce, turn the heat to medium, cover with lid slightly adjar and let cook stirring occasionally until sauce has reduced and beans are cooked through.After the beans are cooked you can add the optional tbs of butter. Cook your linguine or pasta of your choice to desired doneness and add to the tomato and beans, cook for a minute or two. Turn off the heat grate some romano or parmigiano or both on top and toss to combine. Its delicious thank you so much. Hope you are feeling better Suzanne. Well it does have some carbs from the pasta but about half of what you would get from a bowl of pasta, I subbed beans for some of it. Thank you so much. I love this Suzanne! This is my kind of dish. I imagine the texture of the long beans went so well with the linguine. I love greens beans cooked in tomato sauce and make it at least 3 or 4 time a year. I’m definitely going to try your idea with linguine. 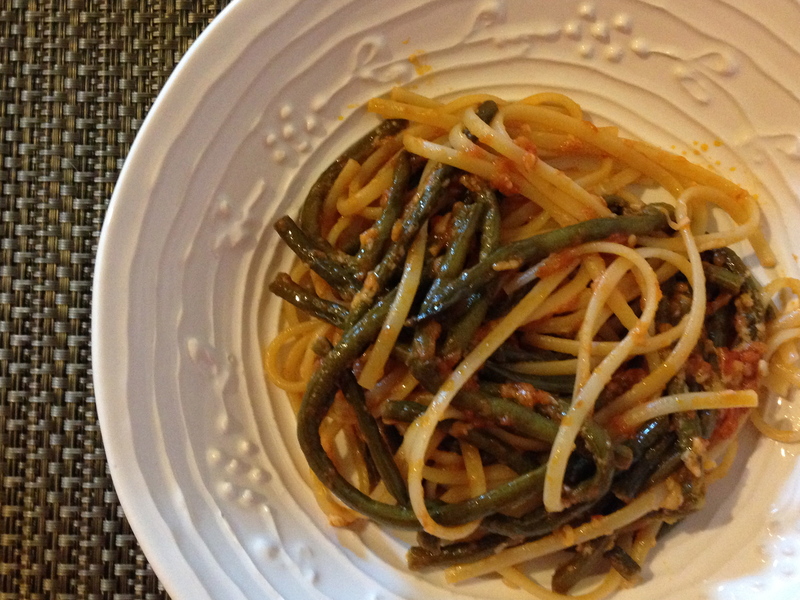 Yes the long beans went so well with the linguine and the fresh tomato sauce is perfect with all of it. Thank you so much. I love that gorgeous produce! This sounds like a great weeknight dinner. Thanks Mary Frances, yes a great weeknight meal, I almost didn’t post because i thought it too simple but then I thought how can anything be too simple really? Thanks again. Love this recipe. Long beans are so delicious and straight out of someone’s garden…unbelievably good! Well done. You let the flavors speak for themselves. How about you cook and I bring the wine! Yum! Your food always looks and sounds so good. Cheers! Now that would be nice. You would do an excellent pairing, it would be fun! I’m gonna try this Suzanne! But right now my kitchen is under construction.I will let you know when I do. Hey Flora, kitchen under construction is a good thing, that means you are going to have a newly renovated kitchen. Congrats! Thank you so much and best of luck with the kitchen reno. That’s my kind of bowl Suzanne! Love linguine more than any sticky pasta. The addition of green beans is surely interesting. Thanks, I love linguine, of the long pasta its my favorite, that and fettuccine. It reminds me a little of the Persian dish Loobiya Polo, only Italian and made with pasta. Great dish, Suzanne! Simple yet rich and full of flavors. Reading your post, I’m trying to remember if I have ever had long beans … looking for them next time I go grocery shopping. I have never seen long beans in the grocery store and the only time I have eaten them is in Asian food. They are wonderful though, I thought they were terrific in the tomato sauce. Thanks so much Francesca. Wonderful photos and I love the combination of beans and linguine – really my sort of dish, particularly with tomato sauce. I’ve never seen long beans for sale here – they look similar to green beans – are they a similar taste and texture? Sometimes the simplest dishes are the best and I bet this is no exception. How are the pugs? I’ve never heard of the long beans, but i do like green beans cooked with tomatoes. And that photo of fresh tomatoes has me drooling! Hugs. They are wonderful if you have a China town where you live you might be able to find them. They are worth the effort to find and yes tomatoes are so good!! Perfect for summer! I’ll have to look for long beans. I see them sometimes, but not always. Thanks Susan, they are wonderful, I like them better than regular green beans, now I want them all the time. That’s such a clever idea cooking the long beans in the tomato sauce. The pasta dish looks delicious. Thank you so much, I love the long beans in the tomato sauce. Love this Suzanne! Never would have thought to do this combination! I love long beans! Never would have thought to pair them with linguine. What a fabulous idea! Looks delicious! Thank you so much, it turned out to be a great combination. Thank you so much the long beans and tomato is wonderful together. This looks like such a light and healthy summer pasta dish. You always know how to best use ingredients. I love linguine, all pasta dishes for that matter and make it a couple times a month, your plate full looks delicious! I have never tried long beans, no one at our farmers market grows them. I never saw at my farmers market either, but I could have missed them, Going to look on Saturday and see if they have them. I really like them so much I want more. Thanks Michael! Do they taste like green beans? Johnny, I just love you, you make me laugh, The visual of you with a table cloth wrapped around you eating some spaghetti is priceless. If you can get some long beans do it, they are fantastic, I am still waiting for good corn and tomatoes, they are a bit late this year maybe it was the cold winter. What a tasty vegan, long bean tomato sauce for pasta. It is definitely my kind of meal. Yum! Thanks Fae, it’s really good. Thank you, the dish is so simple and fast to make. Good GRIEF ! – how could I forget how much I ADORE pecorino ??? I must be completely mad ! (No response required.) This is a seemingly simply pasta sauce, but the kind that I really like. Thanks, Suzanne ! Thanks and me too love Pecorino, it is simple but really a delicious dish. What a wonderful dish, so simple. Will be picking up some green beans Sunday at he farmers market to make this. Thanks! Thanks Cheri, yes it’s very simple but really good! Aren’t they wonderful! Thanks Uru! Looks like my kind of pasta bowl Suzanne! I am not sure I can get those beans around. Any option that might replace them, without altering the recipe too much? Viviana if you cannot find long beans use haricot vert, thank you do much. Thanks Liz, Asian is the only way I have ever had them prepared but must say they took to Italian like they were meant to. Lovely to see what you’ve been making with your gifted produce Suzanne! I think you’ve done these beans proud… what a delicious way to serve them. Fabulous! Thanks Margot, I thought it would be nice to use long beans in a different way than they normally are and they were amazing. Now I always want to use long beans like that. Thanks again. ciao! i so like your sauce. i often make a similar sauce with french green beans, spaghetti, grape tomatoes, garlic, italian parsley and basil…and with green beans in mind, this past tuesday, i made dinner x 8, my primo piatto was trofie al pesto genovese- french green beans but did not add potatoes. your produce availability and preparation is just the best. Sounds delish and I am so hungry wish I had some! Thanks so much. I’ve never had long beans Suzanne. I’m intrigued that you described that as tasting slightly floral. Will watch for them at the farmers’ market. Glad you posted this. I like looking for new things. I don’t know really how to describe but I detected a slight floral note not sure if anyone else would but I really love them and now I want them again. My love for long beans is endless, is a quite common vegetables in Tuscany during the summer, here in Montreal they are not easy to find, as soon as I’m able to find them I cannot resist to buy a lot and cook them straight away! Never thought to use the long beans to season pasta, what a great idea! Thank you yes I too love long beans and don’t see them in the local markets. I was so lucky to be gifted some from that nice lady. I’ve been away from blogging for a few weeks and I’ve begun to miss your delicious food. My mouth is watering right now !!! Summer fresh supper! 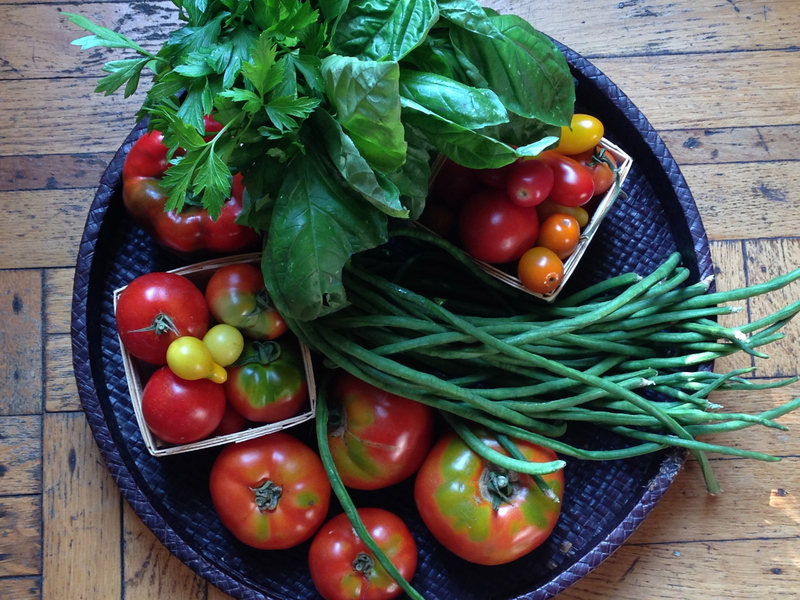 I love the photo of your fresh ingredients Suzanne! It was a wonderful meal and I really want to duplicate it. I need some more long beans and other than the sweet ladies garden they are kind of hard to find. Thank you so much. 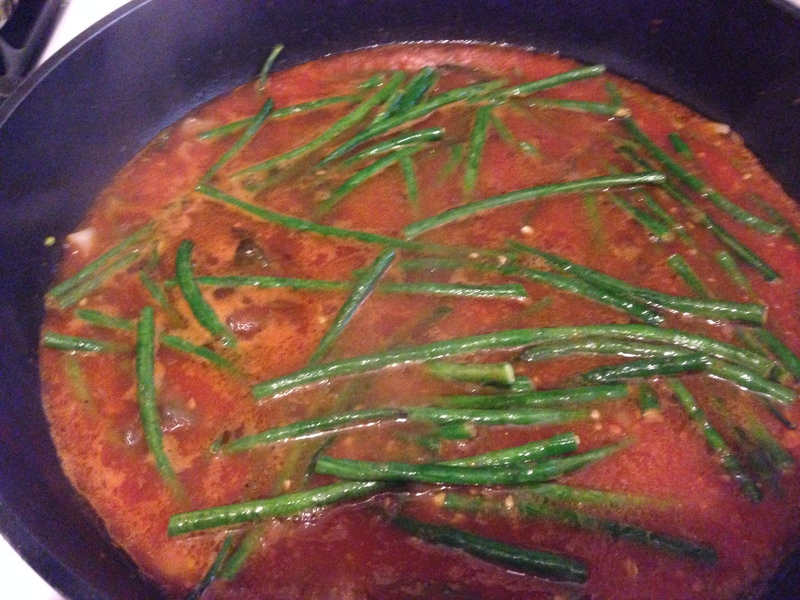 I really loved the ling beans in the tomato sauce.i want to make again. Thank you! Oh I love long beans, I wish I had more. Thank you so much. Love this Suzanne… It reminds me of the family parties when I was growing up. Each of my aunts (my grandmother had 11 children) had a specialty that you could count on them bringing to the party…and the green beans in sauce were my Aunt Babe’s (her name was Prudence) specialty. I had an Aunt Babe, maybe we are related!!! This dish is so simple but so delicious. I just love green beans in tomato sauce. Thanks Prudy! Oh gosh that looks amazing and incredibly easy Suzanne. 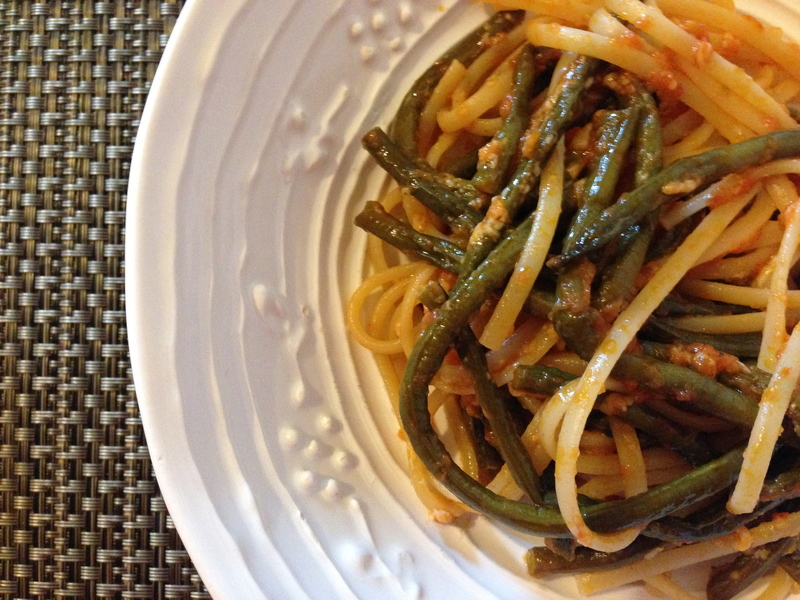 I have never added long beans to a tomato sauce, but it sounds so good! Such beautiful veggies. Love the linguine! This was my first time, saw those gorgeous long beans and tomatoes and thought it would be good to try and recreate my Moms dish. It turned out great. Thanks Brandi.